The iconic mini is fifty this year and organisers of the Dunlop Great & British Motorsport Festival are appealing to owners of classic and new generation minis to bring their cars along to their first event of the season. They are particularly looking for a mini from each decade from the 1960s onwards to be put on display at Rockingham race circuit, where the event is taking place on 18th and 19th April. Pride of place will be given to an original 1959 mini. Dunlop Great & British Motosport Festivals take place at racetracks right across the UK throughout the season and the Rockingham event will feature some nostalgia for racing fans with the Mini Se7en Championship, the modified 1300 Mini Migla Championship and MINI Cooper Challenge. Also on the weekend race card is the BARC Dunlop Sport Maxx Cup, exciting racing which provides a stepping stone to the British Touring Car Championship, plus the fantastic Westfields, TVRs, production saloons and Radicals. Anyone wanting to participate in the parade should just turn up in their mini on the day. Those who would like their classic minis considered for display should contact the track directly at mini@rockingham.co.uk with some details and pictures of their car. The six owners of the cars selected will each receive a free pair of weekend passes to the event. There will be plenty of family entertainment off-track with face painting, children’s entertainers and trade stands. Fans will also have the opportunity to get close to the action as general admission includes access to an open paddock. This isn't the only MINI event coming up. British music icon Paul Weller will top the entertainment bill at MINI United 2009, which is being held at Silverstone race circuit from 22-24 May. Calvin Harris, Chris Thompson, Raygun and Twisted Wheel complete the line-up of outstanding British musicians, DJs and bands brought together to celebrate MINI’s 50th birthday. 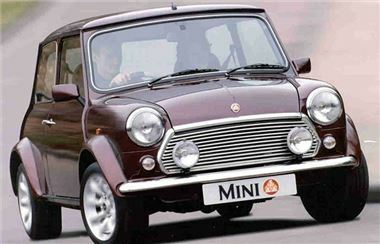 The MINI United festival, which in previous years has attracted MINI fans from around the world to events in Misano, Italy and Zandvoort, Holland, is coming home in 2009. An all-British entertainment programme worthy of such a significant milestone in the life of MINI is set to light up the greatest birthday party of 2009. Artist, remixer and producer Calvin Harris is kicking off the weekend playing a full live set with his band. Calvin is one of the most in-demand DJs in the world, has collaborated with the likes of Kylie Minogue and recently scored a massive chart number one hit in the UK; with Dizzee Rascal on the track “Dance Wiv Me”. Calvin has also specially curated a bill to DJ in support of him. Chris Thompson, former lead singer of Manfred Mann’s Earth Band, will open the night with a special guest appearance. He will be followed by the band Raygun, who were selected by US superstar Pink to support her on her current European tour. The final support act is Northern upstarts Twisted Wheel, already a rising force in the UK. The band has a reputation as one of the most driven and ferocious live bands around, and has earned prime support slots with mega-acts including Paul Weller, The Enemy, Kasabian and Oasis. Headlining MINI United 2009 is none other than Paul Weller. Former lead singer of The Jam and The Style Council, and a massively successful solo artist, Paul is a music icon and a fitting headliner for such a special event. As a special treat, Twisted Wheel will be performing one of Paul Weller’s classic songs as a tribute on the night. This unique version of the track will then be made available online at www.mini.com after the event. Tickets for the full three day programme cost just £35 each and may be purchased online now at www.miniunited.com Admission for children under 14 is free. As well as an array of high-profile musical talent, MINI has prepared a multitude of activities guaranteed to keep visitors’ adrenalin pumping. Thousands of MINI owners and fans from across the globe are expected to descend upon the Northamptonshire site for the festival. Guests will have the opportunity to drive laps on the Silverstone track in their own MINI or as a passenger with a MINI CHALLENGE competitor, as well as watching the third and fourth races of the popular MINI CHALLENGE Clubsport series. The Mini Seven Racing Club will be staging a race in which up to 40 classic models will compete on the Silverstone circuit. A comprehensive exhibition will guide fans through the rich and fascinating heritage of the brand. Stunt shows, go-kart racing, driver training activities and much more add to the exciting activities on offer to everyone at MINI United. All visitors will be well catered for, with numerous lounge areas, bars and restaurants placed around the Silverstone site. A children’s area will provide entertainment for the little ones with ‘Bobby-Car’ racing, climbing, face painting and much more. Silverstone is situated just 35 miles from Oxford, the home of MINI. For fans who want to experience MINI production first hand, plant tours will be offered. As places are limited, MINI United visitors should contact oxford.plant-tours@mini.com at the earliest opportunity to request a tour.